Recently a customer sent along a photo of two items that he wanted displayed in one display case and to just place them next to each other on a single level base just didn’t seem to do them justice. So, after I convinced him to give me artistic freedom I came up with this design. I made the base 10″ wide front to back and placed a second shelf 4″ high and 5″ wide behind the base making two shelves for these items to be seen together yet separately. The customer was literally overwhelmed and sent me a truly beautiful thank you for my design. I think also the light natural finish on the oak offsets the dark bases of the statues which I suggested and again, the customer gave me the artistic freedom to do this. 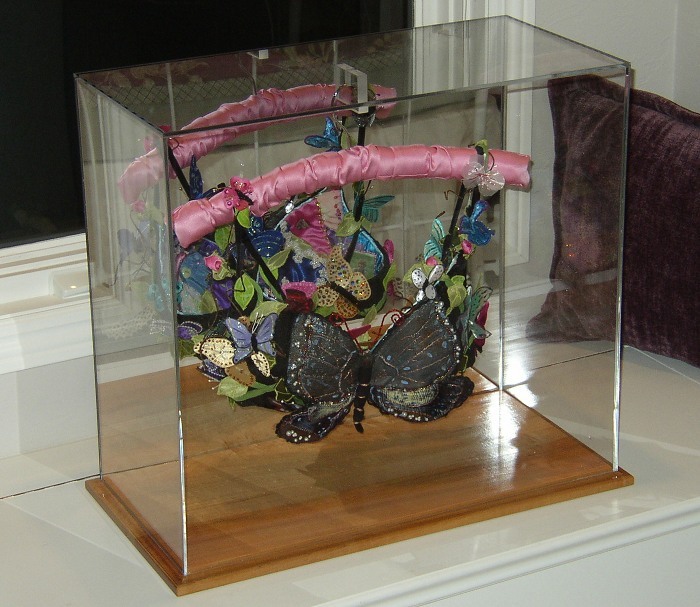 I am always open to working with any customer’s needs and come up with best possible solutions for a display that will enhance and still protect your precious items. 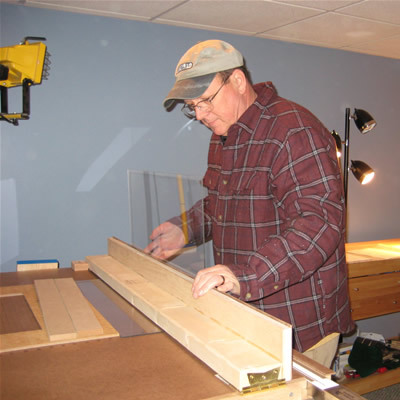 Give Grandpa’s Cabinets a chance to build a very high quality custom display case for you for your precious one of a kind items. 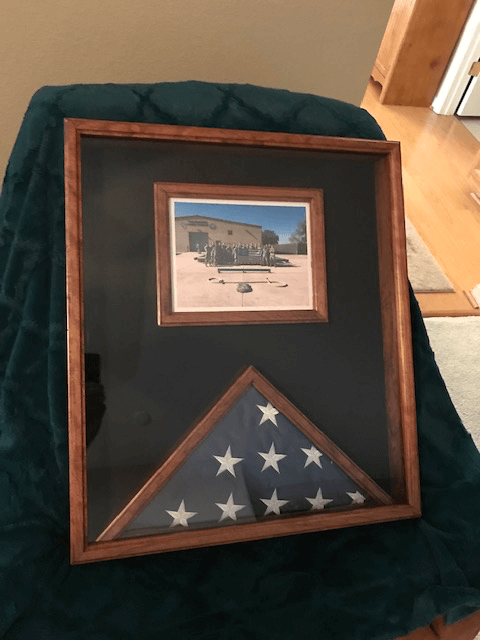 Grandpa’s Cabinets was approached and asked if I would be interested in building a display case that would hang on a wall to house both a folded American Flag and a photo the client’s father. The photo was important to his son who lived across the country from him. After I received a photo of a design, I happily agreed to take this custom display case project. 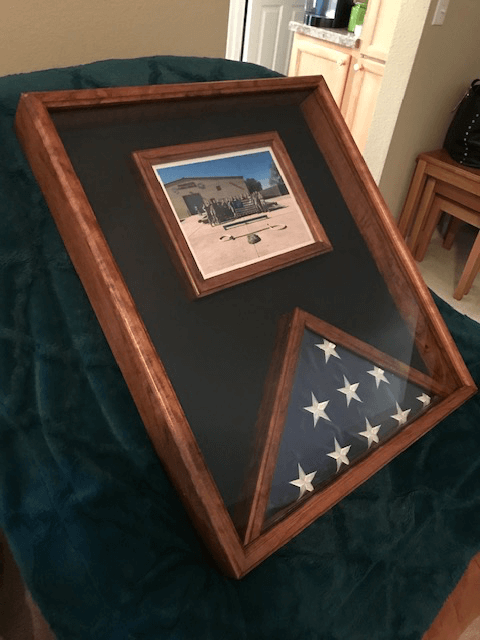 He sent me both the flag and the photos to have here so I could make the display case fit them perfectly and assemble the finished case for shipping directly to his son in New Mexico. The first thing I did was to cut and mill all the individual pieces that would make up the case. I used solid cherry wood as the wood of choice and as the finished photos show, stained in Red Oak stain for a dark rich color. After I laid out all the parts and did a fit and finish inspection, I cut and mitered the trim pieces that would surround the faces of the three parts of this case. You’ll notice, there’s a framed, raised box to hold a photo, a triangular box to hold the flag and the overall large box to hold both. I cut all parts and then did an extensive amount of sanding to get all the wood to a smooth finish to accept the stain and satin polyurethane topcoats. I actually assembled this case in the “raw” and decided to stain and finish everything as an assembled case. This affords me the opportunity to do a nicer finish sanding of all joints etc without worrying about over sanding any parts of the assembled case. I used acrylic sheets for the faces of the photo case, flag case and over the entire case when assembled. The background is a black material that’s glued to the plywood back. The wall mounting system I chose for this case consists of two piece of aluminum bars that fasten to the wall and back of the case and the case part sits into the wall piece to give a very strong hold and keeps the case always level. Grandpa’s Cabinets was given the privilege of building a custom display kit to house a spectacular model, hand built by Jim Farrens of the German submarine U-552 from World War II. Jim spent a huge amount of time and money to create a true work of art in his rendition of the submarine and I am pleased to report a little information about the sub’s history and show the model. U-552 was launched on September 14, 1940 and went into service on December 4, 1904. Her nickname was Roter Teufel which means Red Devil after her mascot of a grinning devil painted on the conning tower. She was involved in two serious actions in October of 1941 when she sank the USS Reuben James which was the first US Navy warship to be lost in World War II. This is significant as the US was still neutral at the time. Another controversial action was in April of 1942 when she sank the freighter SS David H. Atwater off the US seaboard. With the sinking of the Atwater, the action was considered controversial because she was a coastal steamer, completely unarmed carrying 4000 tons of coal from Norfolk, Vriginia to Fall River, Massachusetts. U-552 surfaced about 600 yards from the freighter, opened fire with her 88mm deck gun and machine guns without warning. The bridge of the Atwater was decimated and all crew officers lost their lives there. The real contraversary was because once the Atwater was sinking and the crew were trying to launch the lifeboats, the sub continued to fire on the men as they worked. They ended up jumping into the sea and swimming to any remaining boats still afloat. The model Jim has created here is remarkable in it’s detail and perspective. He has done a remarkable job with the painting of all the figures and different parts of the interior of the sub. When you look at the cut away areas it’s as if you’re actually looking into a working sub! When Jim contacted me for a display case to house this model, it was decided that because of the size of the model, and the size the case would have to be to accommodate the model properly, a display kit was in order. He decided on oak as the wood of choice and the finish is natural with topcoats of satin polyurethane for protection and a furniture finish. 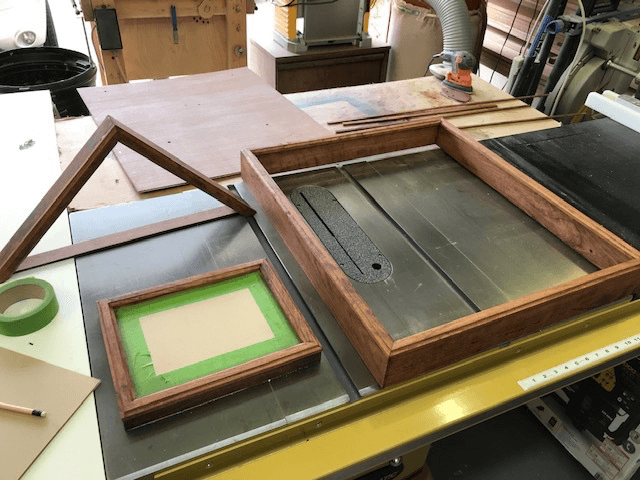 With all kits Grandpa’s Cabinets makes, all the pieces, the base, four corner pieces, acrylic panels and framed acrylic and oak top comes apart easily for access to the model and goes together just as easy. The kit isn’t glued or screwed together but rather sits nicely on its own with the top and base keeping all the kit together and upright. This keeps the model clean, dust free and keeps curious hands from touching the model and possibly harming the work as it is delicate and fragile. When you have a model, special item, memorabilia piece or just about anything that’s special to you and needs protection, remember to go to www.grandpascabinets.com. There you’ll find blogs, photos in the huge gallery of past work, comments from current and past customers and a chance to Request a Quote on the same named tab. Hope you like this build by Jim Farrens as much as I do. Grandpa’s Cabinets is happy to announce the creation of another option when it comes to your design choices for your next Custom Display Case order. 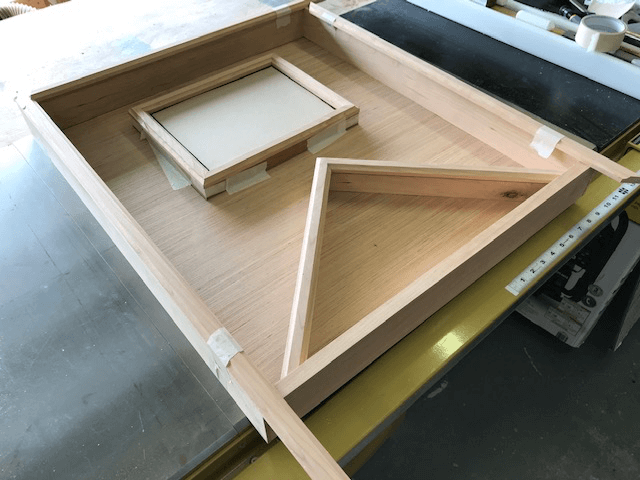 In the past, the base on any Display Case has been made from a piece of hardwood that has had the edges routed to create a fine finished edge with a raised platform that the acrylic cover sits over to keep it steady and secure. Lately, I’ve been asked to make the base to have a groove that you would set the cover “into” rather than “over” the raised base. Because of the recent popularity of this and since the stability is the same for either design, you now have the option to choose which design would better serve your needs and finished look. I’ve made a new video that shows the difference in the two options to give you all the information you need to make an informed choice titled “Display Case Options”. 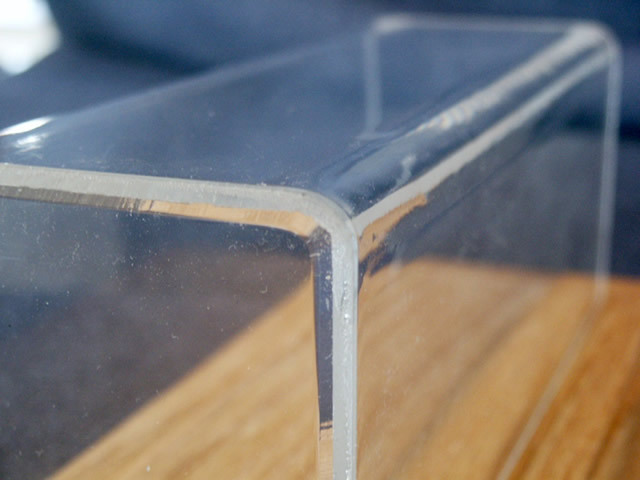 Note that it costs a slight bit more for the grooved base but no matter which option you choose, I know you’ll be totally pleased with the finished Custom Display Case. Here at Grandpa’s Cabinets, I get asked almost daily about how a display case should be sized and designed to get the best looking display of the customers model or piece of art. Each item is different and really needs to be evaluated as to the best way to get it shown with the most impact on the person admiring it. It seems the majority of items being displayed in a display case are models built with painstaking accuracy and attention to detail and require security and protection from interested hands and dust. Here are a few bits of information I want to pass along to all who are thinking of ordering a display case for their precious items. When I ask for information about the size of case the customer wants, I always ask for the ‘inside dimensions” that need to be followed as determined by the customer’s model and desires. However, when asked for my input, I recommend the customer allow between 1 and 1/2 inches at the front, back, sides and at the top for the model to have a presence in the case that gives all attention to that item. I feel any more open space just takes away from the item being displayed and serves no purpose other than increased cost. When a customer wants to display a ship etc., they need to take into account the mounting the item will have in their size requirements. Invariably there will be one or two who forget to allow for those finials or mounts that their model sits on and come up short in the inside height dimension. As I try to do in the woodshop, measure twice and cut once! In closing, it’s always a very good idea to place your item in the position you want it to be displayed and try a few different poses. When you’re satisfied with the look you want, then measure the case “inside” dimensions you’ll need allowing that 1 1/2 or 2 inches on all sides and the top. I think you’ll be very pleased with the end result once Grandpa’s Cabinets has built you the quality display case to house that very important item. 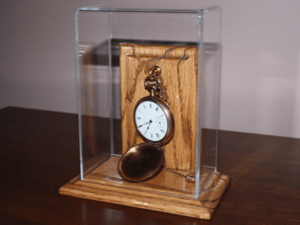 Also, remember, I build display cases for ANYTHING that has value, whether monetarily or sentimentally, that needs protection and a furniture quality display case and EVERYTHING I build is custom and hand made by me personally, right here in the USA! Go to www.grandpascabinets.com or call Ron personally at 586-506-2222 for information and suggestions. 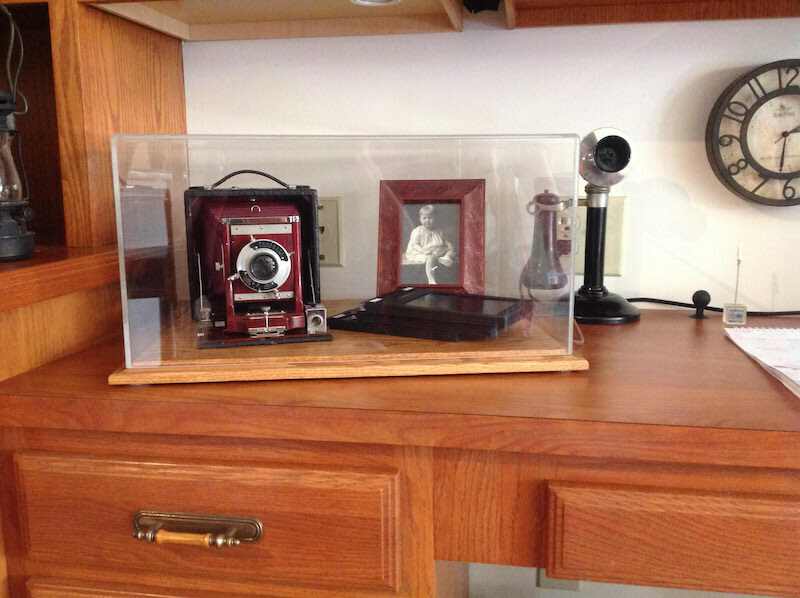 Grandpa’s Cabinets gets requests often for cabinets and display cases that are not in the norm for what we do. This isn’t a problem most times and this was no exception to that. 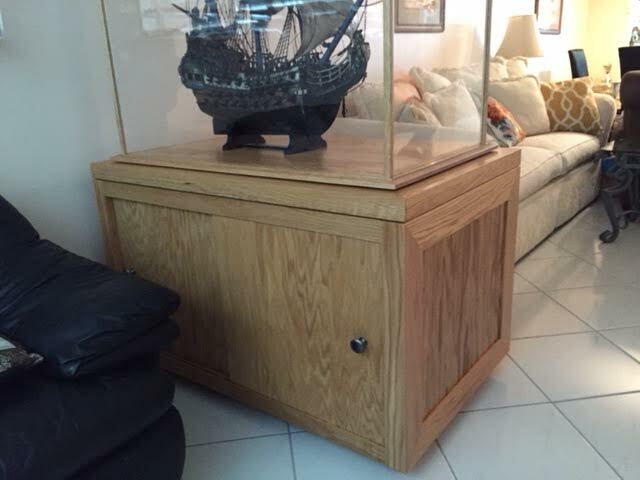 A very good customer commissioned me to build a custom display case in my kit format to house a very large, very old antique sail ship for his condo in southern Florida. After learning the dimensions needed, I realized it was probably going to be the largest ever ordered. Once we confirmed the dimensions needed, I got to work on his order and completed it in two weeks and as agreed, I even delivered it personally to St. Augustine because it was too large when packed to be shipped by UPS or any conventional means. 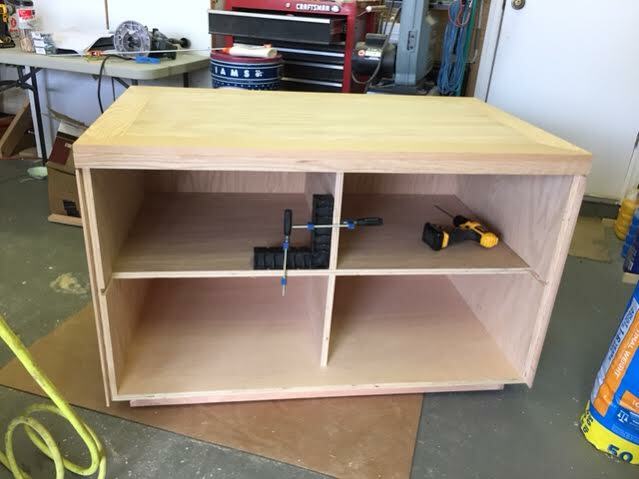 About two weeks later, I received a phone call stating that he needed a cabinet to place this on because he had no furniture large enough with a big enough footprint to comfortably hold the cabinet! He even had an architect friend design a cabinet with storage to do just that and here I go with another challenge and project to fix a situation. 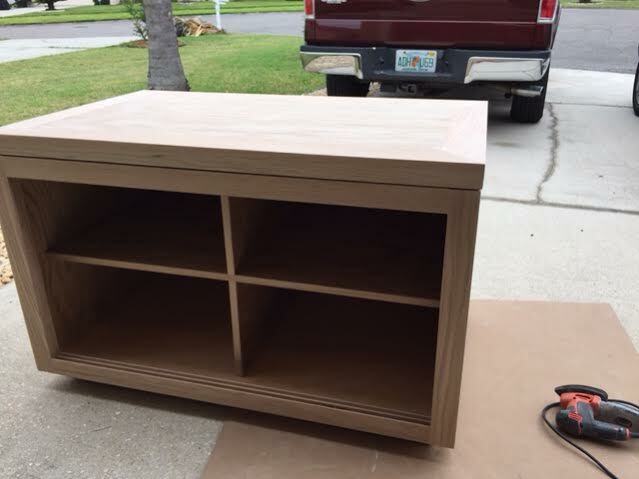 I began construction in solid oak per his request of a simple cabinet. Here you can see the design starting to take shape. The base has a toe kick at the very bottom with wheels mounted just inside and just high enough to allow movement but not be seen from a distance. The sides and divider inside are of furniture grade oak plywood secured with glue and dadoes for strength and support. The top was made to look like it is about 2″ thick by inserting plywood into the middle of a framed cover of solid oak. Here is the cabinet completed in the rough without the doors inserted yet. You can see the thickness of the top and the front framing of solid oak which gives this a truly furniture quality look. After mounting the doors and hardware and application of 4 topcoats of oil based polyurethane this cabinet took shape very nicely. The finish I choose is satin in gloss for cabinets like this because I feel it looks more appealing to the eye and doesn’t show dust as fast as a gloss would. I never choose flat because I just don’t think it brings out the grains in oak well. Now it was on to delivery time for this piece of furniture and a look at how it will all be once assembled. I rarely get to see completed work so this was much anticipated. I delivered the cabinet to the customer and realized he hadn’t assembled the display kit as of yet so I got to do it all for him. He wanted to use this as a sort of room divider in his condo and I feel it worked well for it’s intended purpose. After moving the cabinet into position, I proceeded to assemble and clean the display kit base and acrylic panels and get the ship mounted and set. This case and cabinet overall is about 48″ long by 29″ wide and sits about 7 feet high together just to give some idea of size. I’m very proud of how the entire project came out and the customer was overwhelmingly pleased as well. 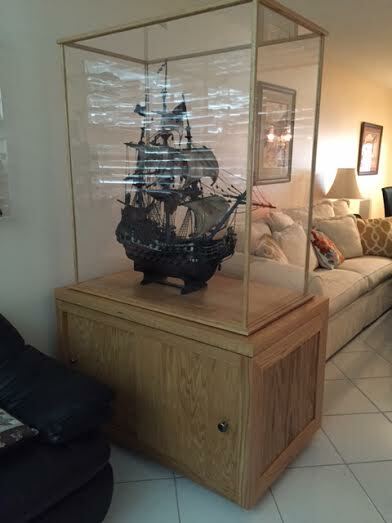 If you have any need for a custom display case to display your works of art or models, never hesitate to contact me. 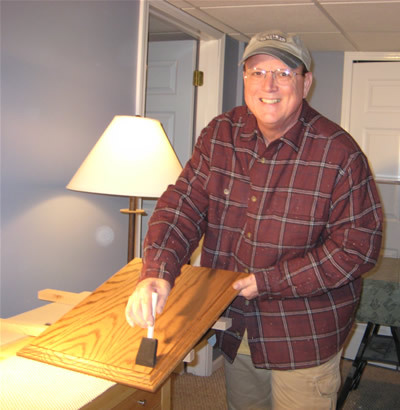 Ron Baluch, www.grandpascabinets.com or give a call with questions at (586)506-2222 and for a fast quote, go to the “request a quote” spot on my website. I spent much of my spare time last year working on the Revell 1/400 model of the Queen Mary 2. My wife and I had crossed the Atlantic on the ship and it is a fond part of our shared memory. As I neared completion I began searching for a display case on the web. After comparing the options (construction, cost, etc.) I decided to purchase from Grandpa’s Cabinets. It was one of the best choices I ever made in purchasing over the web. Ronald Baluch at Grandpa’s Cabinets crafted a fine acrylic and oak case for my model (it got a strong thumbs up in terms of construction and value from someone who works at a major display case firm). More importantly, Ron provided extraordinary customer service — great shipping and answers to all of my questions. He is a proud (deservedly so) craftsman who values his customers. I will be building another ship this summer and it will end up in another of Ron’s fine cases. 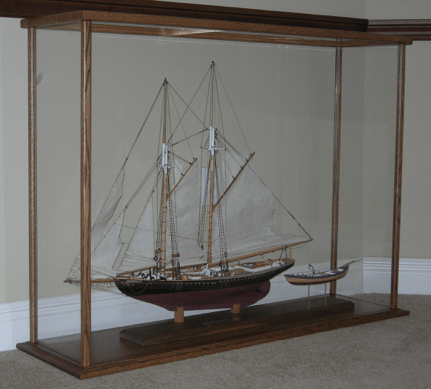 Shown in the photo here is a display case constructed to display a large model of an aircraft carrier a customer requested. 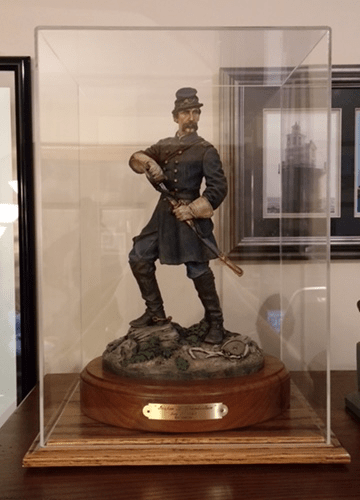 The model was ordered completed and a high quality display case was needed to display this work of art. I explained that my work was of furniture quality and could be proudly displayed in any room of any home in any setting proudly. 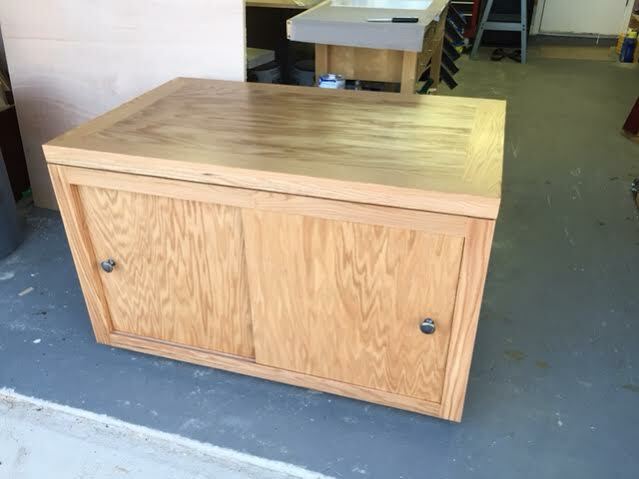 This case was determined to be too large to be built in the conventional method, which is to have a solid oak or other hardwood base and an all acrylic cover with no hardwood trim. This happens when because of the overall size, the case would be too large when packed to fit within the guidelines of UPS for size or the danger of damage during shipping because of size becomes an unavoidable problem. So, with that in mind, I suggested this model be housed in a display case kit. I used red oak as the hardwood of choice and finished it in a dark walnut stain by Cabot with two topcoats of a clear satin polyurethane. My kit cases are unique in that they require no tools, glues or screws to assemble, and just fit together and the case becomes self-supporting when assembled. The kit comes with everything and can be assembled in minutes easily by one person. In this case, the customer surprised me with a unique idea. He wanted light to be shined on the model, and decided to investigate using an aquarium fixture placed on the top of the case. I discussed this idea with him, and we decided to place some spacers between the light and the top acrylic cover to prevent any heat from warping or damaging the acrylic cover. At Grandpa’s Cabinets, we get to see a lot of beautiful ships that have a lot of history. I recently built a mirror display case for Frank Losquardo – Seaman First class on the USS WASP. Frank received the model as a gift for his 90th birthday and honors his service to his country. From a craftsman viewpoint, the mirror display casewas a difficult one to build but it came out great and it was exactly what the customer wanted.